So today is the big day! 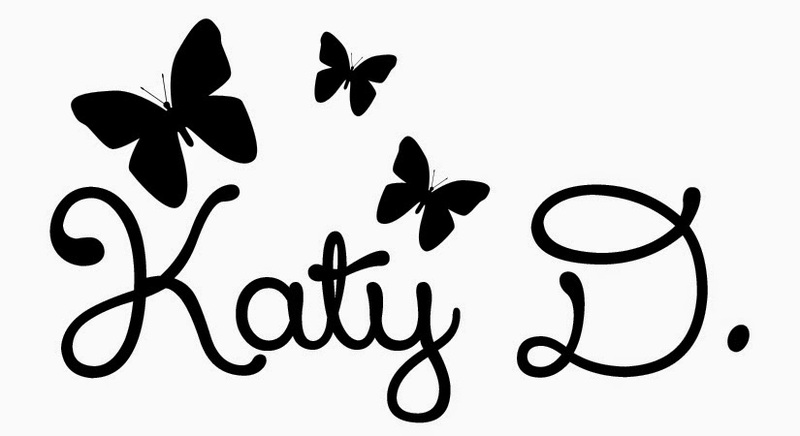 :) It's Katy, and it's time for me to share my Halloween decoration with you using Great Impressions Stamps. This is a paper pumpkin made out of paper strips. 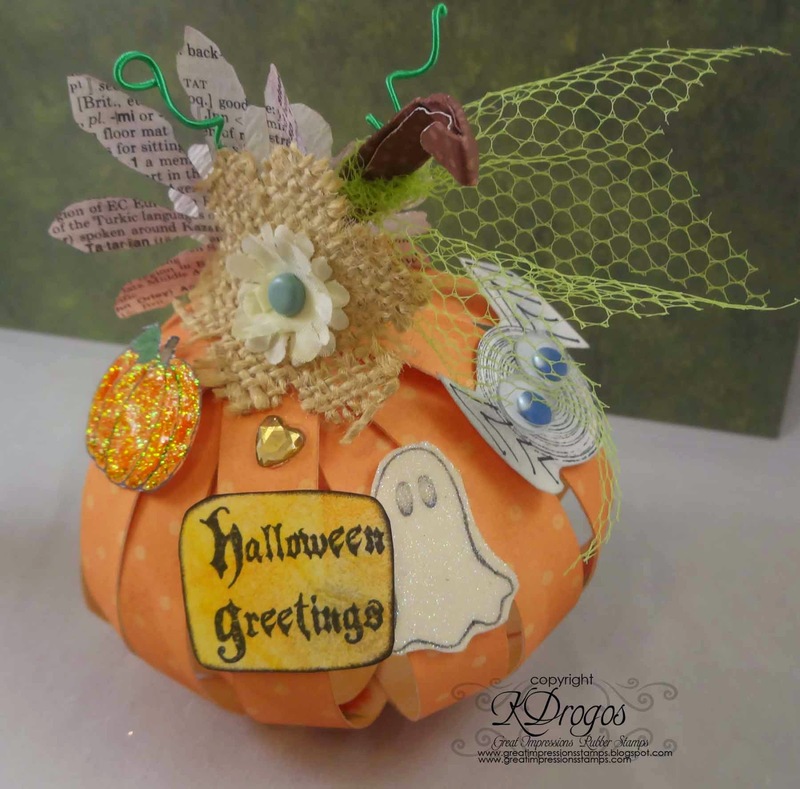 I used my stamps to embellish the outside of this little pumpkin. I think it is good by itself, or if you made a few of them they would be cute together. This little pumpkin also acts as a vessel for goodies. You can put candy in the middle! 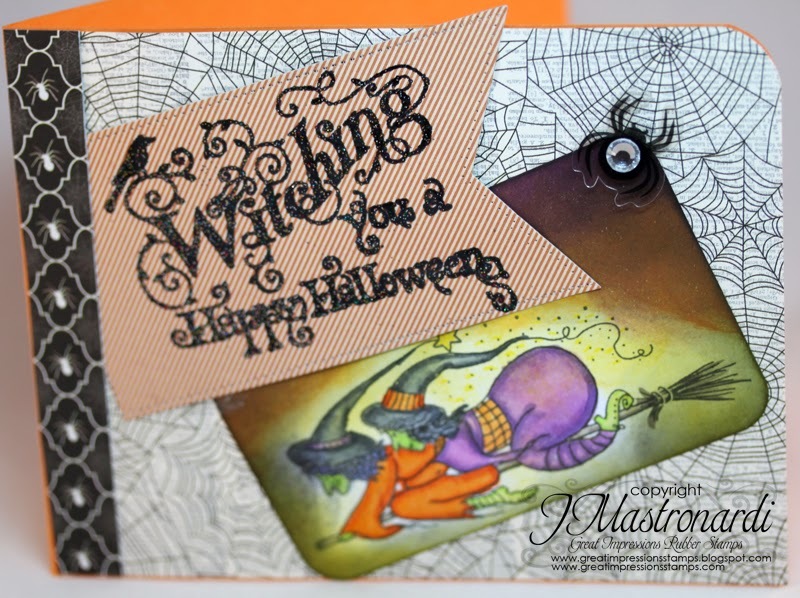 I used these stamps: E551 Too Cute Pumpkins, A134 Halloween Greetings, C406 Little Ghost, E645 Retro Spirals. I hope that your day is full of candy and fun! For more inspiration check out our Facebook page and Pinterest Boards. This is the same little ghost that I used on my card a few weeks ago, but here I removed the sentiment from him. I heat embossed the BOO! and the ghost images in sparkly black (hard to see in these photos) and then filled in these little ghosts with glossy accents. I'm not sure where this little banner will go, but I LOVE the way it turned out! Thanks so much for stopping by to take a peek at my creation! Hop over and come play along with our monthly challenge, too! If you use stamps from Great Impressions, you'll be able to link up your creation in our Customer Gallery, too! HUGS and happy stamping to you all! 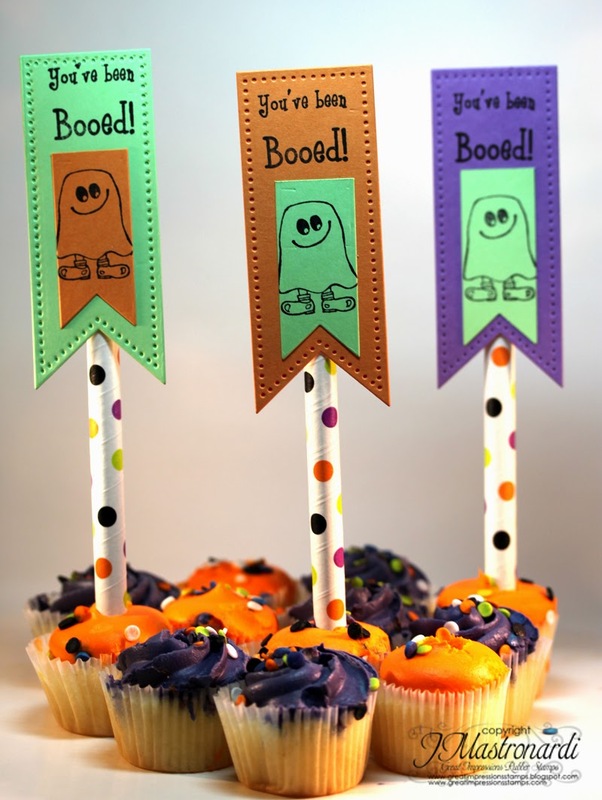 I had some yummy fun creating these Halloween decorations for some mini cupcakes. I used a couple of dies to create the cupcake topper. I stamped the C455 Halloween Ghost on the little tag. Then I layered it upon a larger pendant die cut. 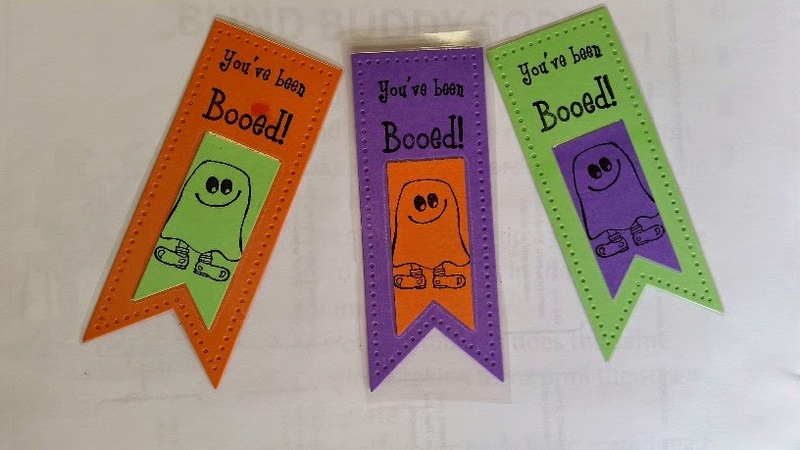 I stamped B236 You've been Booed at the top! I am going to remove the toppers from the straws, laminate them and give them to my class to use as bookmarks! Hi there! Leah here and today I have an idea to share with you for a cute but simple Halloween decoration. 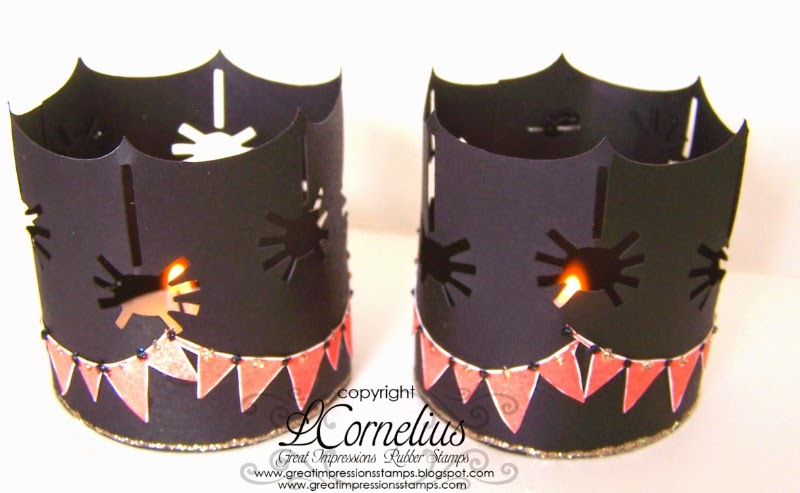 I used my Silhouette Cameo and cut these cut little spider votive candle holders and assembled them. 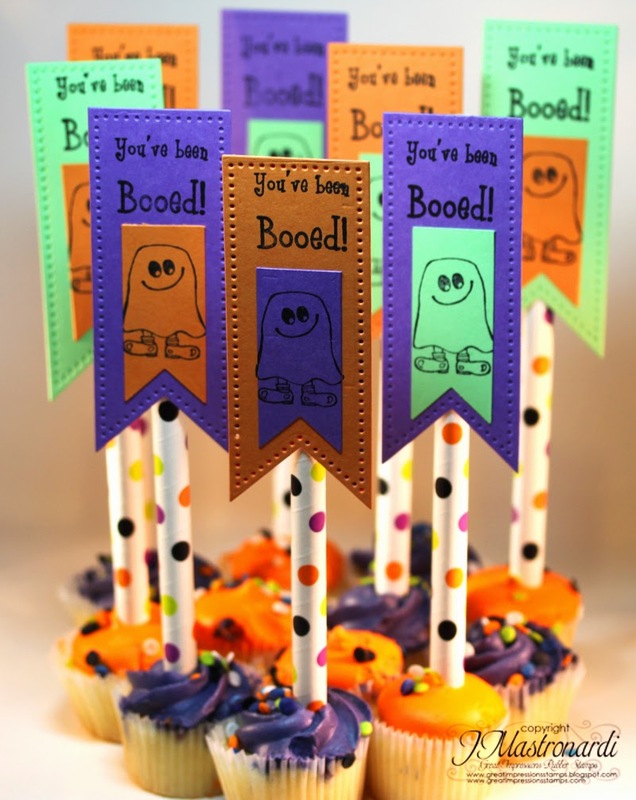 Then I stamped several Flag Banner (E846) images in orange and adhered them. For some sparkle I added some Stickles glitter glue. I think these would look cute on the table. I hope you like them! 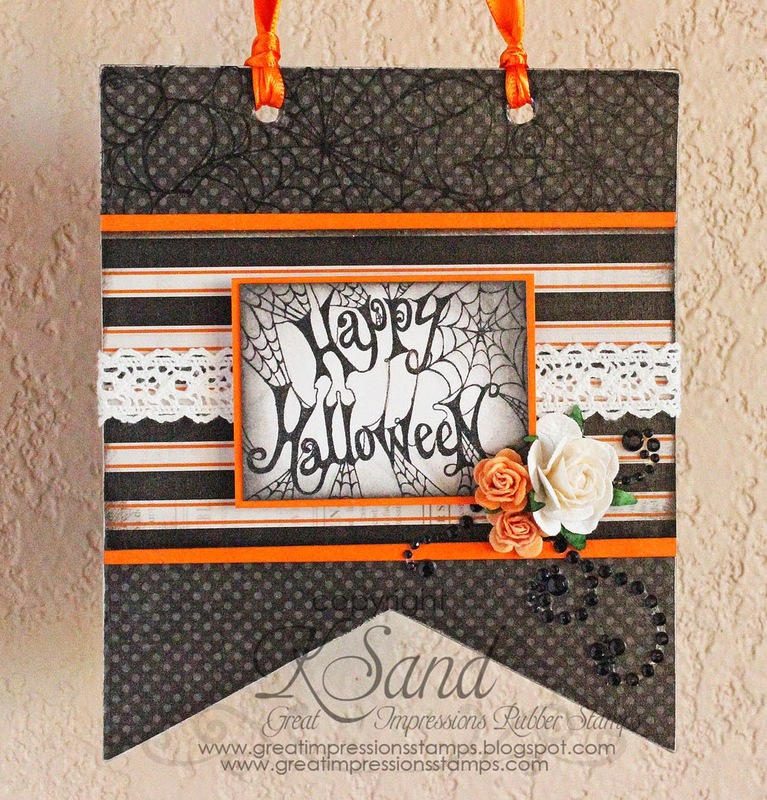 Kendra from Luv 2 Scrap 'n Make Cards here today to share a Halloween plaque with you! 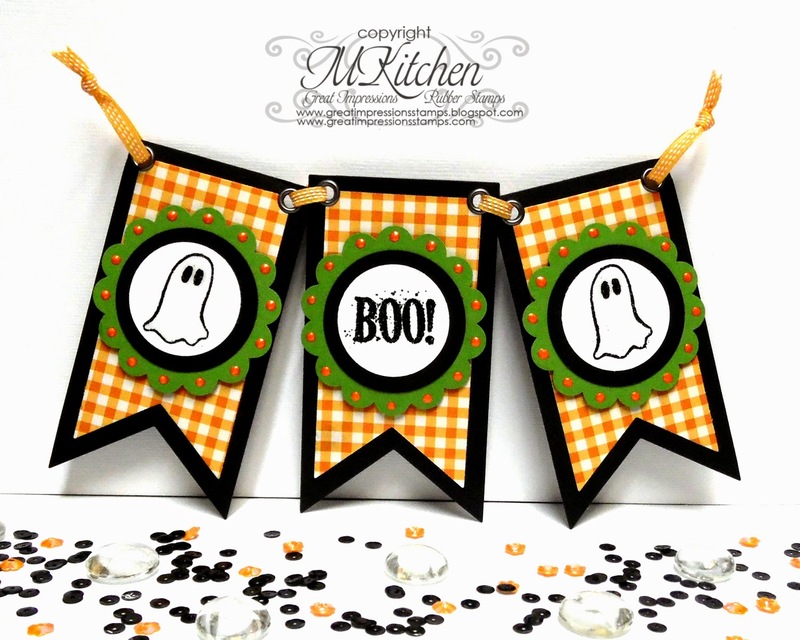 This week is all about Halloween Decorations! Be ready to be inspired!! I really like how it turned out! The kids love it as well! I used the G379 Spider Web along the top of the plaque on the black polka-dot paper. I also used the F455 Happy Halloween for my main image! Hello to all of my Great Impressions friends! 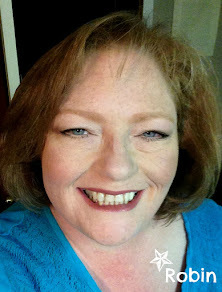 This is Ellen from In a World of Craft with more inspiration from the Great Impressions store! Today is the fourth Saturday and our GI monthly challenge is in full swing, so you still have time to join in! Today, I thought I would try to trigger your Christmas spirit with a little more Christmas cheer! 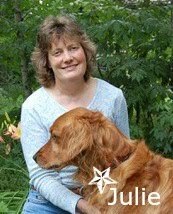 Please stop by my blog for details and leave a little love! 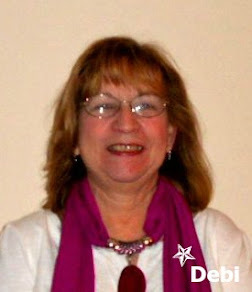 Katy here, and today I am sharing with you 2 tags that I made using stamps from the Great Impressions Store. 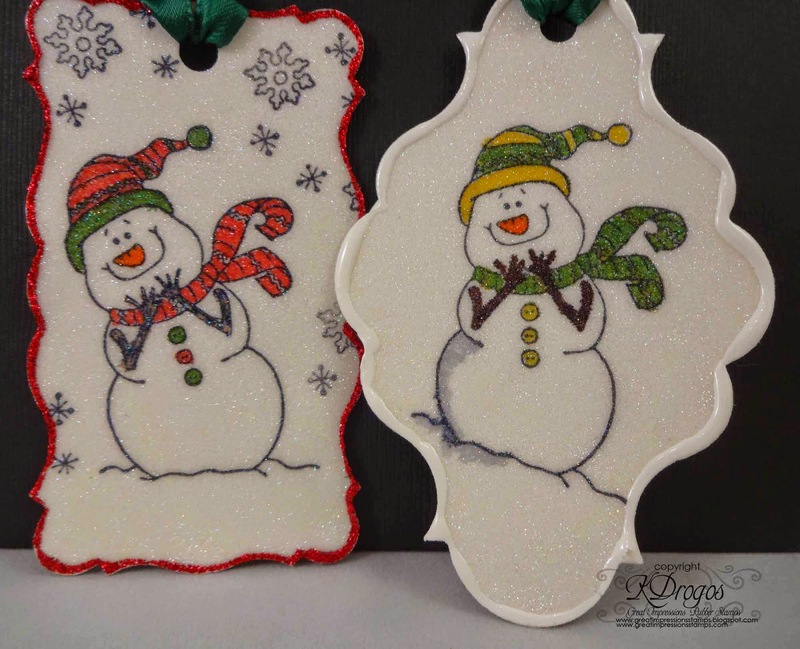 For these two Christmas tags I used the following stamps: B171 To & From, E774 Snow Adorable, and A71 Snowflake Cluster. 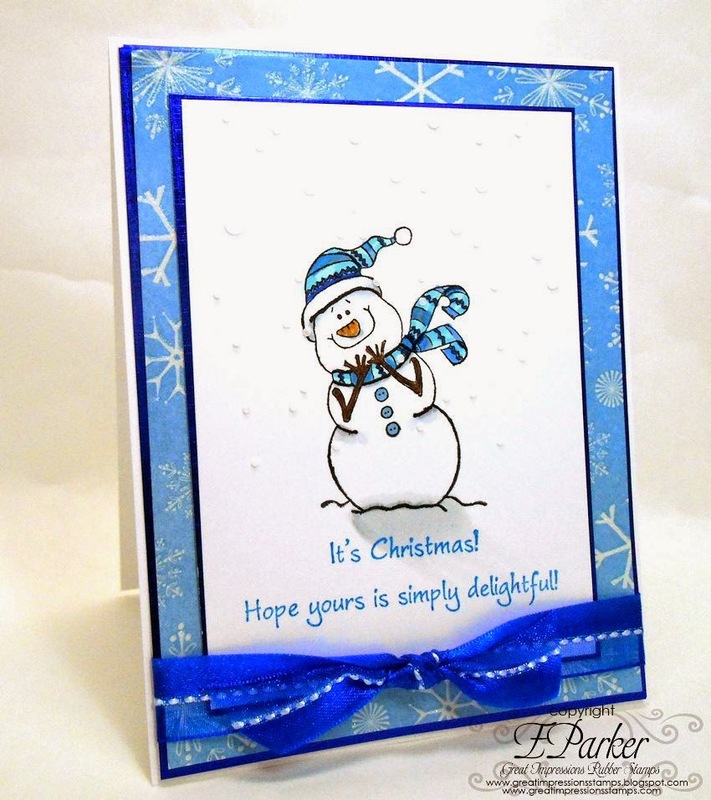 The Red Hat Snowman is outlined in red stickles and has the Snowflake Cluster stamp stamped on it about four times. The Green Scarf Snowman is outlined with Ranger's White Enamel Accents. These tags aren't complete until we know who they are To and From! Thank you for stopping by! For more inspiration be sure to check out our Facebook Page and our Pinterest Boards! :) And check out our Monthly Challenge! It's almost Halloween and today I have these adorable H260 Halloween Puppies from Great Impressions. I added the E809 Batty Moon in the corner with some glassy glaze for accent. I colored them with some Distress markers and framed them in white to contrast the black spooky background. 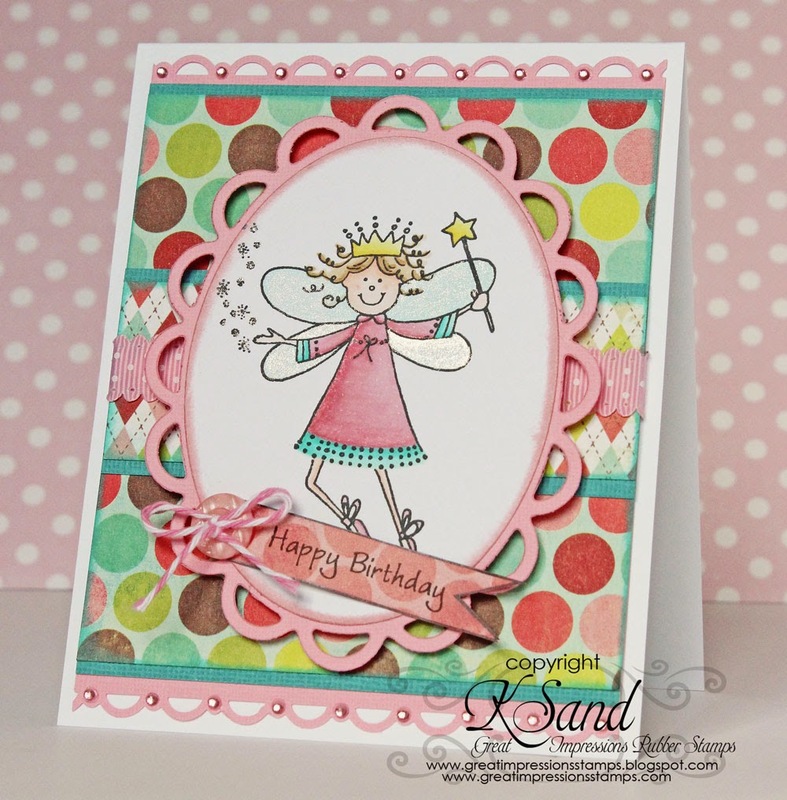 Kendra from Luv 2 Scrap 'n Make Cards here today to share a sweet Birthday card with you! So I decided to take a little break from all the Halloween projects to create a sweet birthday card. My daughter's little dance friend had a birthday party a few weeks back. Isn't the image sweet?! Perfect for any little girl! I used the G398 Birthday Angel! I added a bunch of sparkle to the image! I also used the "Happy Birthday" tag from the G483 Tags set! Hello to all of my Great Impressions friends! 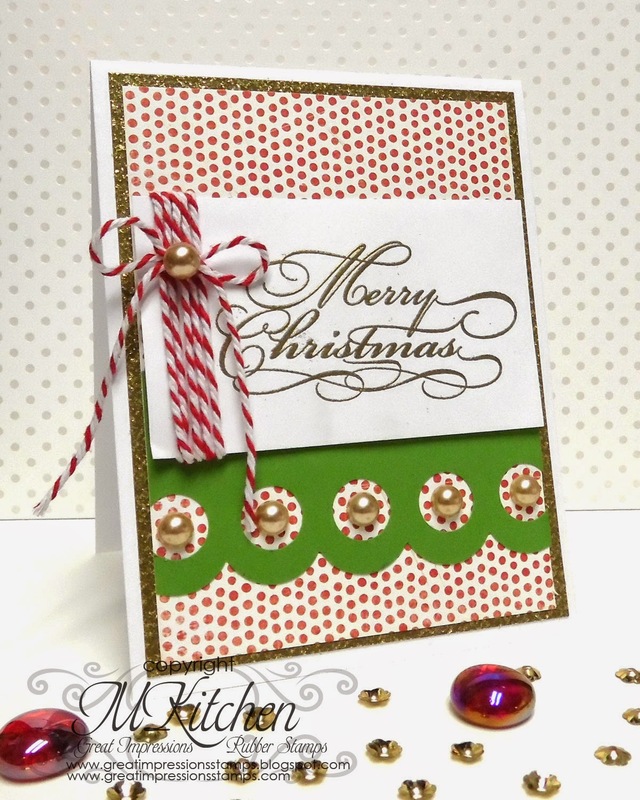 Ellen here from In a World of Craft with inspiration from the Great Impressions store! Today is the third Saturday and our GI monthly challenge is in full swing, so you still have time to join in! Today, I thought I would try to trigger your Christmas spirit with a little more Christmas cheer! Want to learn more about this card? Please check my blog for all of the details! 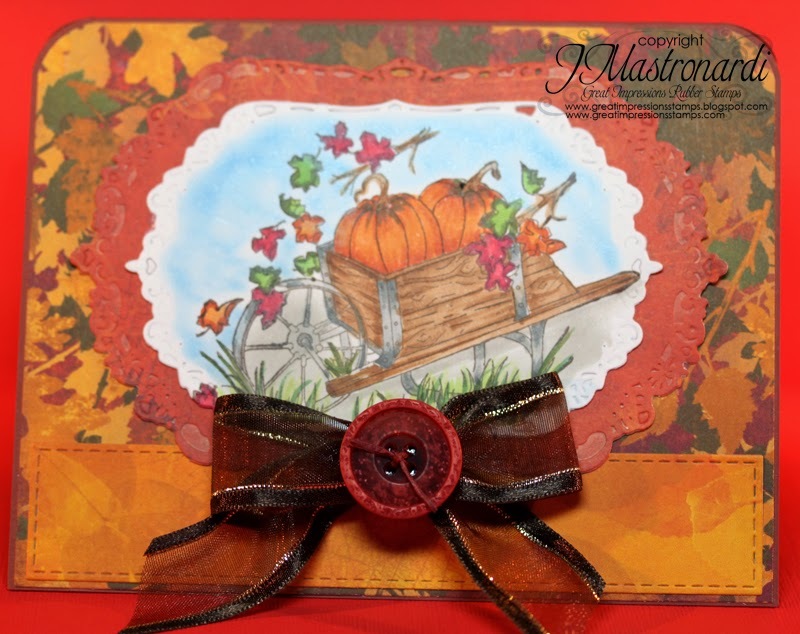 I used these stamps to create this card: E551 Too Cute Pumpkins and D330 Happy Thanksgiving. I used light modeling paste mixed with a re-inker and a stencil to create the dots in the background. I used glitter around the circle. For the sentiment I stamped it then cut it out to fit the shape that it is on. Hey, y'all! I hope everyone is having a great week and a wonderful day! 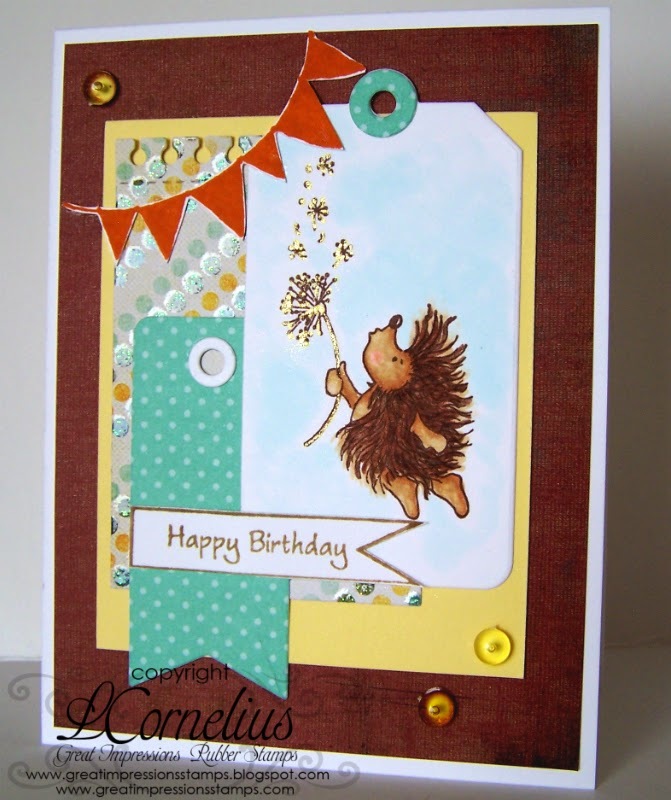 I'm back today with another creation using stamps from the Great Impressions online store! 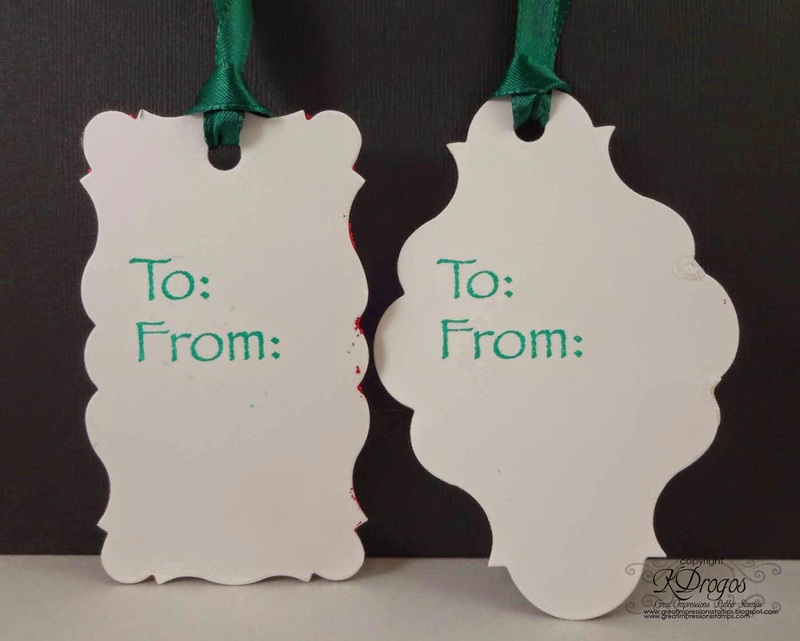 Today I've got a Christmas tag to share with you--it's NEVER too early to start holiday crafting!!! More detail photos can be found on my personal blog HERE. 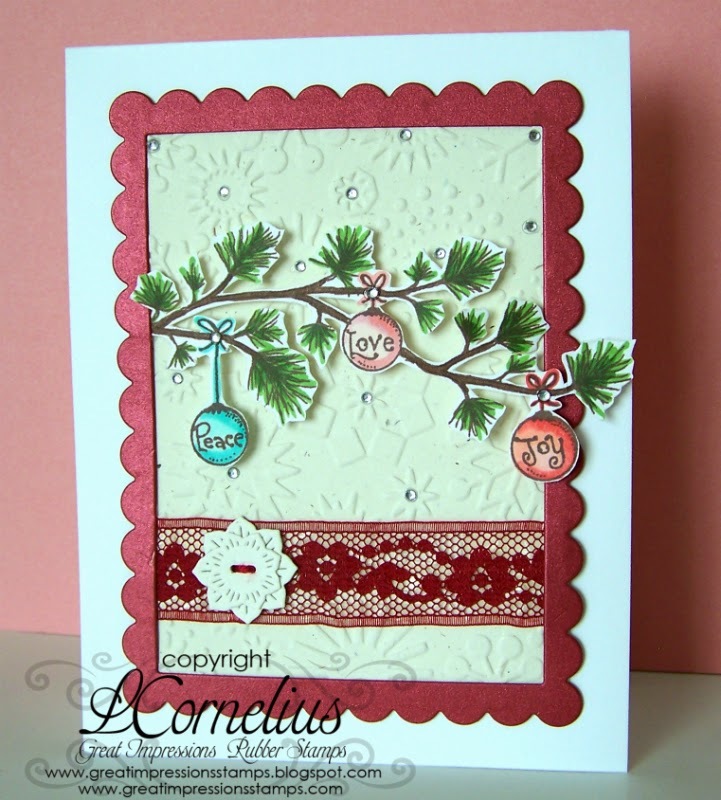 For my focal panel, I did a little collage stamping with G140 Pine Branch and D281 Berry Sprig. I find that when I do collage stamping, it's best to employ generational stamping as well. This adds more texture to your panel. 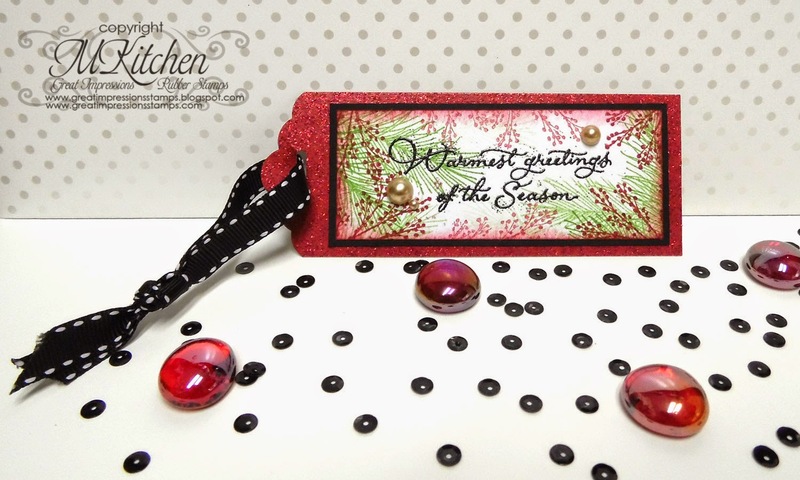 I finished this portion of the tag by sponging the edges and adding part of F249 Warmest Greetings, embossed in sparkly black, as my sentiment. A few pearls were the perfect elegant accent to highlight this beautiful sentiment. 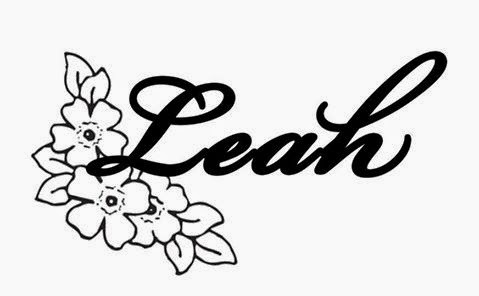 Hello Great Impressions fans :) Leah with you today. Are the leaves changing where you are? We don't have a lot of trees that change where I live, but we do have a few and they are very pretty. In my front yard we have a big maple tree and it's my favorite. 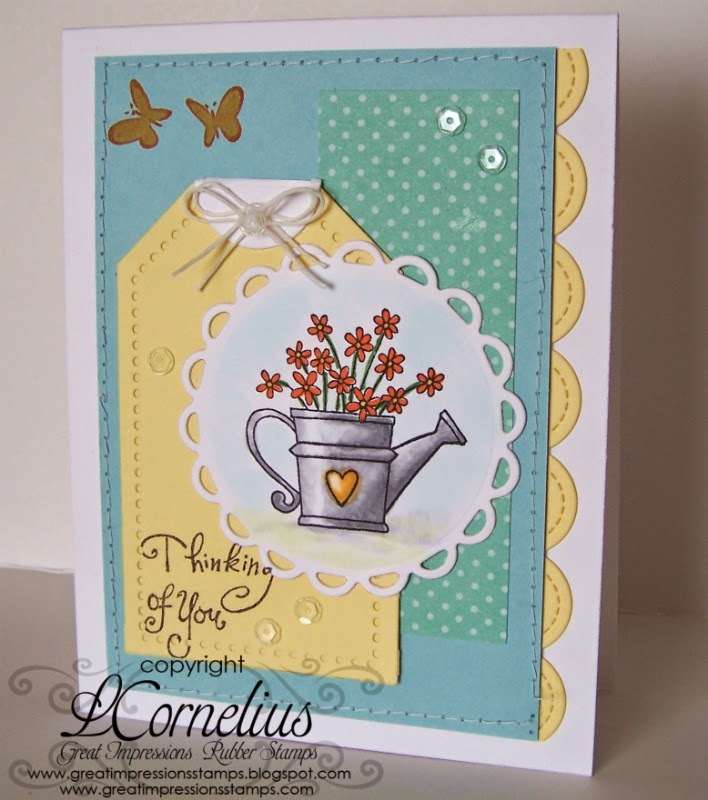 For my card I pulled out the sweet Watering Can of Flowers (D362) image and made a fall card. I also added some butterflies using the Flitting Butterflies (A32) and my sentiment is called Playful Thinking of You ( B195). I colored my image with Copic markers. I hope you like it! 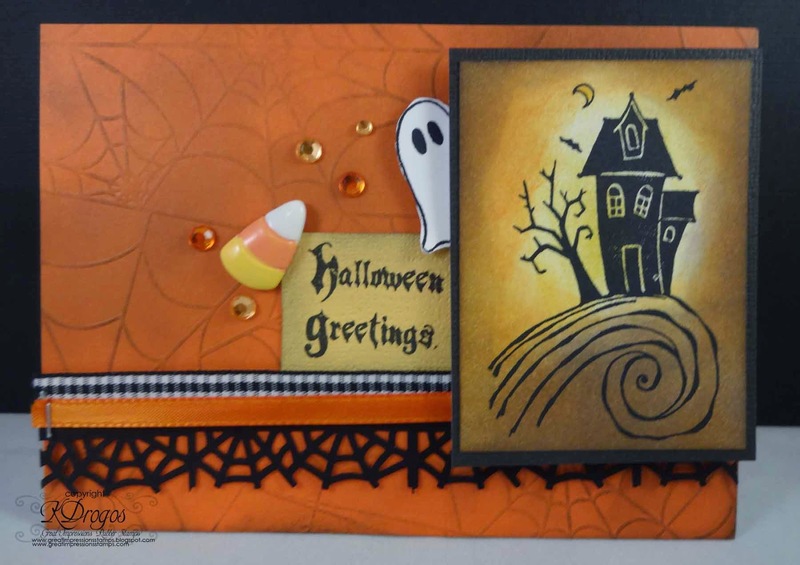 Kendra from Luv 2 Scrap 'n Make Cards here today to share another Halloween card with you! I have enjoyed creating all my Halloween cards this year! GI has so many fun Halloween stamps!!! For my main image, I used the F455 Happy Halloween! 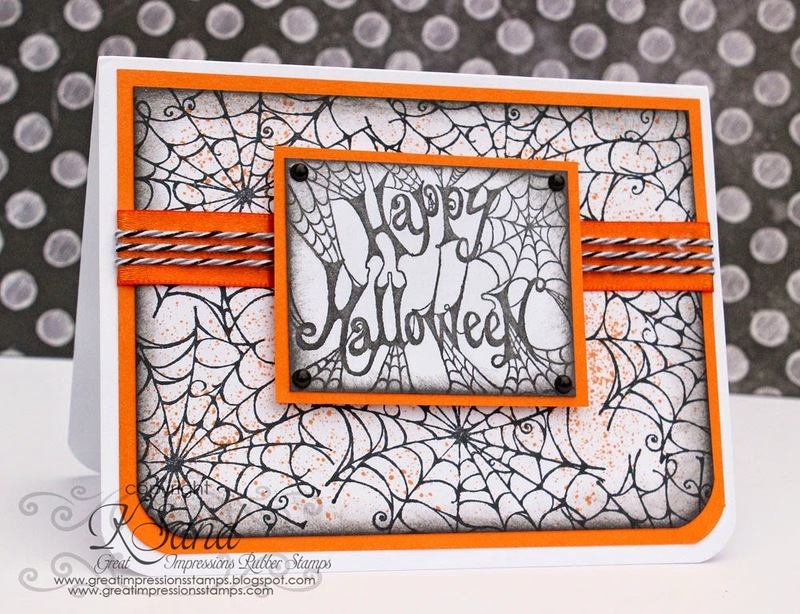 I also stamped a bunch of the G379 Spider Web, to create my own patterned paper!! 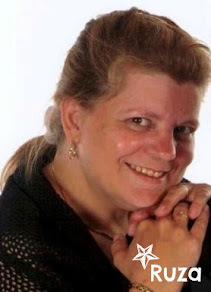 Hello to all of my Great Impressions friends! Welcome back for more inspiration from the Great Impressions store! Today is the second Saturday and our GI monthly challenge is in full swing, so you have plenty of time to join in! Today, I thought I would try to trigger your Christmas spirit with a little Christmas cheer! OK, OK, I can’t stop myself. Isn’t he SNOW ADORABLE???? LOL I think his title is so perfect for him! I colored him with Copics and stamped the sentiment with blue ink. Both stamps are from Great Impressions so be sure to check them out! Happy crafting everyone and please stop by my blog! Katy here and I am sharing with you one more Halloween card. I love this house so much-it's definitely one of my favorites! 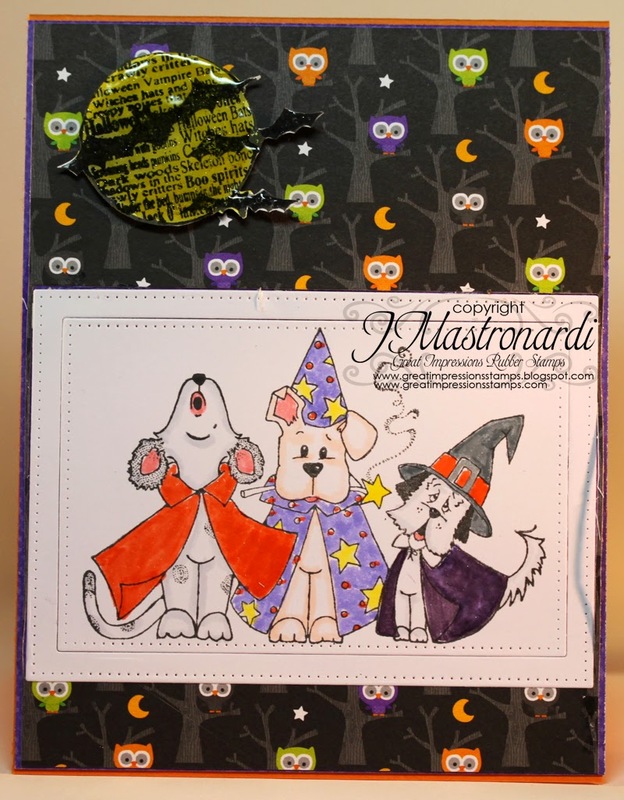 I used the following stamps: F561 Halloween House, C406 Little Ghost, and A134 Halloween Greetings. Hi, friends! 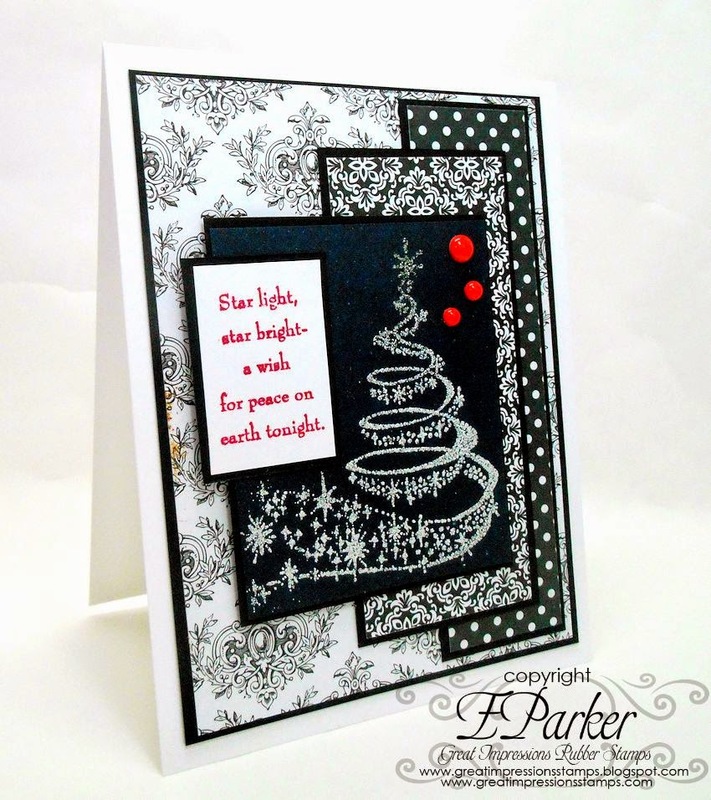 I'm back today with another card using beautiful stamps from the Great Impressions online store! Today I have a fun autumnal card using one of my favorite techniques--spotlighting! Take a peek at the completed project! More detailed pictures on my personal blog HERE. This is actually a pretty easy effect to create. 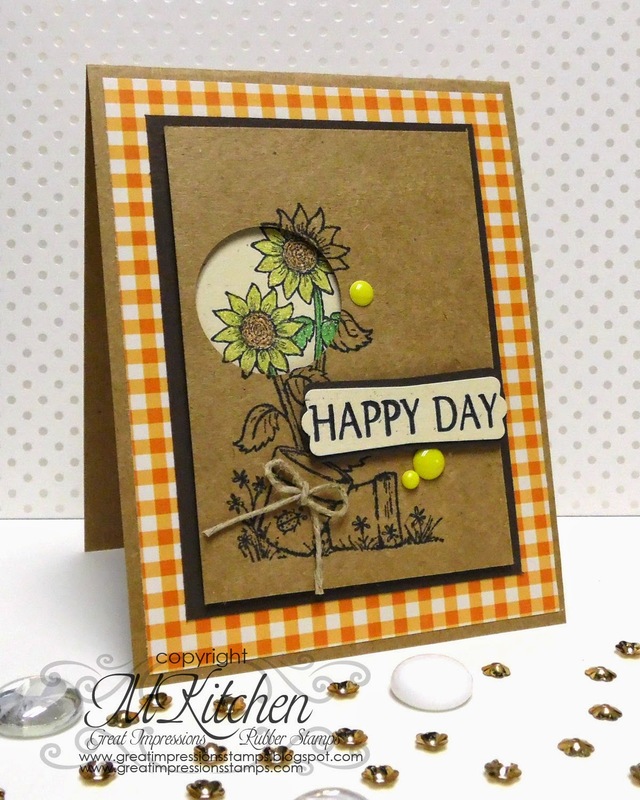 To start, you just need to stamp your image (G196 Sunflower Garden was used here) twice--once on a colored paper (I chose kraft) and once onto a neutral paper (I used cream). You just punch a shape out of the colored paper, color in the image on the neutral paper (I used Sakura glitter gel pens), line them up, and adhere them together with dimensional foam to create a layered look. You don't have to use the dimensional foam, but I think it adds a little something. After that, all you have to do is add it to a panel and put whatever bits you'd like for added texture! I added part of sentiment E842 Happy Day to my panel along with some enamel dots and a bit of twine on the kraft pot. I love it! Today I have some new Halloween stamps from Great Impressions. I love, love, love making Halloween cards. Maybe it's the witch in me hehehehe. I used the G507 Double Trouble in Flight. I colored the witches with copics. I used distress inks to create the eery background. I embossed the sentiment F589 Witching You with black embosssing powder. Good day stamping friends! Leah here today and I have a sweet fall birthday card to share with you today using the super adorable image called Harry Blowing Seeds (F587). I colored Harry with Copics and for the dandelion he is blowing I added some gold jelly roll sparkle. My sentiment comes from the Tags (G483) image and the cute little banner is Flag Banner (E846). 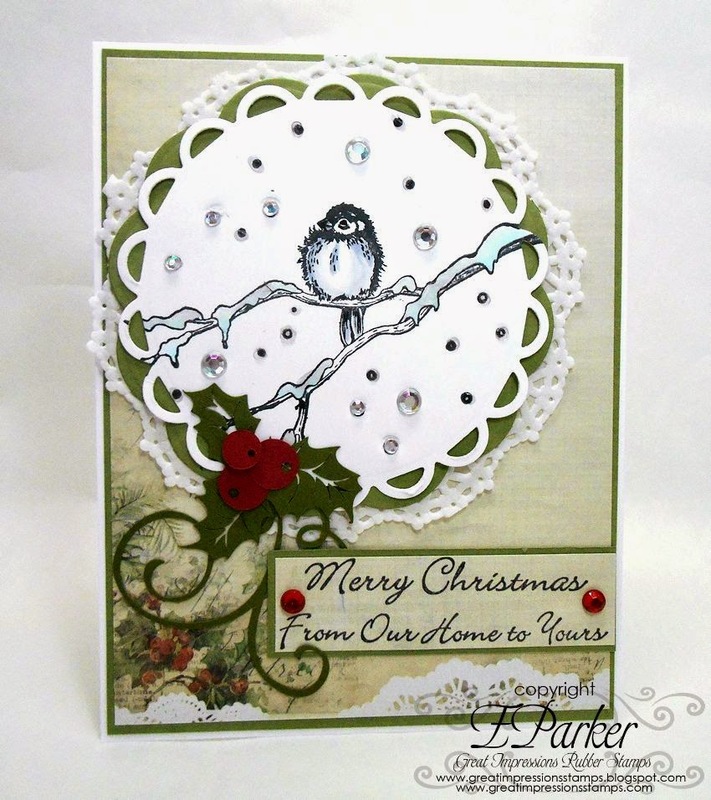 Some layering and a few clear embellies finish my card. I hope you like it.